If you are interested in the value of your home, fill out the form below for a no-obligation home evaluation. Whether you are interested in selling your home in the near future or just curious about its current value, we are happy to offer free Calgary home evaluations (also known as a CMA – comparative market analysis). 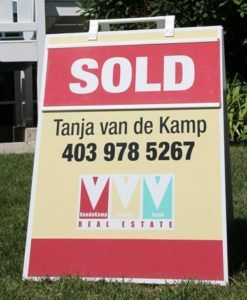 If you are unsure if now is a good time to sell, give Tanja a call at 403-978-5267. This 10-minute conversation – with no obligations – will give you a straightforward answer and help you make a good decision. Do you have a garage? If so, what is applicable to your garage? How would you describe the location of your home? NOTE: At times, we may have to contact you for additional information or schedule a visit to the home. The report gives you details on the current value of your home, as well as the current competition. We also offer a free real estate market analysis for all Calgary communities. These reports include detailed listings, sold prices, days on the market and more. Sign up for a free monthly Calgary real estate market analysis for your community. Can’t find the answer for your question? No problem – send us a message or give us a call. We are happy to help and give you a straightforward answer.